In this episode, fiction editors Leslie Watts and Kim Kessler critique the first chapter of Passage, a fantasy-women’s society novel by S. Thies. This week’s author submitted her scene in first- and third-person point of view, providing an opportunity to talk about how to improve scenes no matter which POV you choose. The answer is MRUs, that is Motivation-Reaction Units. 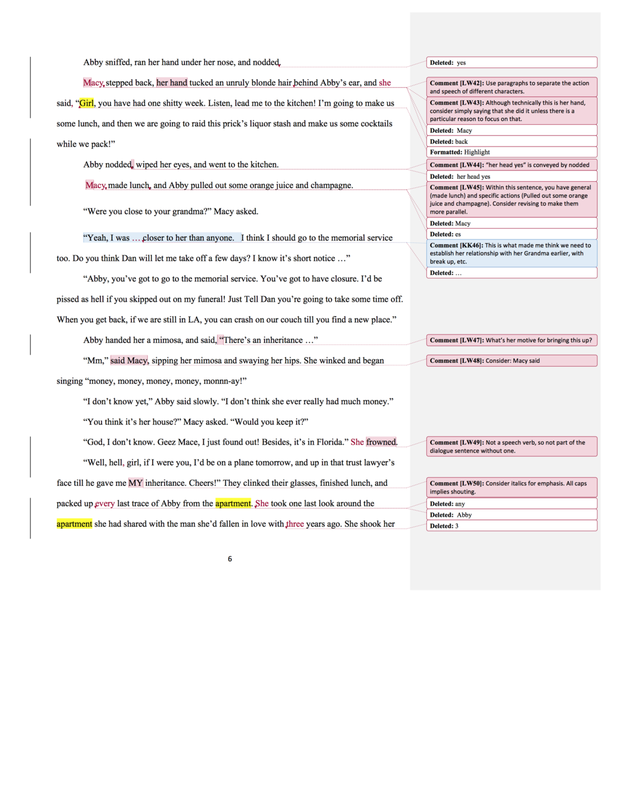 If you practice writing these stimulus-and-response sequences within your scenes, as the editorial mission suggests, your character’s reactions will make sense and be unique to them and your reader can experience the story, rather than have the experience of reading a story. Clark is taking a well-deserved break from the podcast, but our friend and fellow Story Grid certified editor, Kim Kessler, has graciously agreed to jump in and help out. Kim is the author of the upcoming novel, According to Plan. Find out more about Kim on her website. Join the Writership Book Club! For October, we’ll review one or more stories from The Best Science Fiction and Fantasy of the Year, Volume Ten. This week we're welcoming two new members to our Patreon crew! Many thanks to our new Quarter Master Brian Schwimmer and our new Shipmate Kevin Glasgow. If you want to support the show and get some bonus goodies only available to Patreon supporters, click here. As you may know, our co-host Clark has been having a rough time recently. While we as a community can’t help him with his health or rewrite his circumstances, we can help give him a little financial breathing room AND get an amazing deal on his course, Advanced Novel Writing With Harry Potter, at the same time! Advanced Novel Writing With Harry Potter is professionally recorded and breaks down the secrets behind why the series works so well and sold by the boatload. It’s really good stuff. He’s also doing a special on it right now: Pay What You Want. That’s right: The course normally retails for $197, but for a very limited time you can pay anything you want and receive this amazing course in its entirety! Listeners have asked for an index of the podcast episodes and the topics discussed, so we've put together a Google spreadsheet containing details of each episode, its airdate, author name, story title, genre, story type, published location, author website, and topics discussed. Get access to the spreadsheet here. To find out more about Motivation-Reaction Units (MRUs), check out Dwight Swain’s book Techniques of the Selling Writer. The article we mentioned by Randy Ingermanson can be found here. Here's the Writership episode that talks about narrative distance. Here's the Writership episode that discusses how to choose your point of view. To complete this mission, select a scene from your current revision work in progress or a favorite story. Identify the motivation (some kind of stimulus or trigger, something the character observes from an external force. Make a list of these items. Then look for the POV character’s reaction (what the character does). Make a list of the reaction and its type (feelings, reflexes, or voluntary thoughts or actions). Then consider the relationship between the trigger (person, place, thing, thought, etc. ), and your POV character. Think about who she is, her past, what she wants and needs (in other words, her story objects of desire), the levels of conflict in the scene, etc. Does the reaction make sense given all that you know? Do the different elements of reaction happen in the natural order? If you’re working on a scene from your work in progress, revise or write a new one in light of your new understanding. If you get stuck when moving from motivation to reaction, you can work backward. In other words, if you want a particular reaction (especially if it’s something out of character), what kind of trigger or relationship to the trigger, will create that response? If you’re looking at a scene from your favorite story, write your own version of the scene in which the reaction is different. Then change the setup so it fits. We have a special episode coming up in which we'll discuss the scene in chapter 5 of Animal Farm by George Orwell. If you can, I highly recommend reading the scene in advance. It's in the public domain in several countries outside the US, so you can read it here or here. Thanks so much for your submissions and for allowing us to look at the same events in two different points of view. You have a great premise for your novel with lots of possibilities for engaging conflict. The setup makes us want to turn the page, so you’re off to a great start. Kim and I discussed some considerations for POV during the episode. It was so helpful to see both versions. We actually thought the first-person point of view gave Abby a stronger character voice, but you may have other reasons for preferring the third-person version. We wouldn’t want to second guess your decision here. If you’re open to reconsidering, the editorial mission in episode 102 may help you with that. 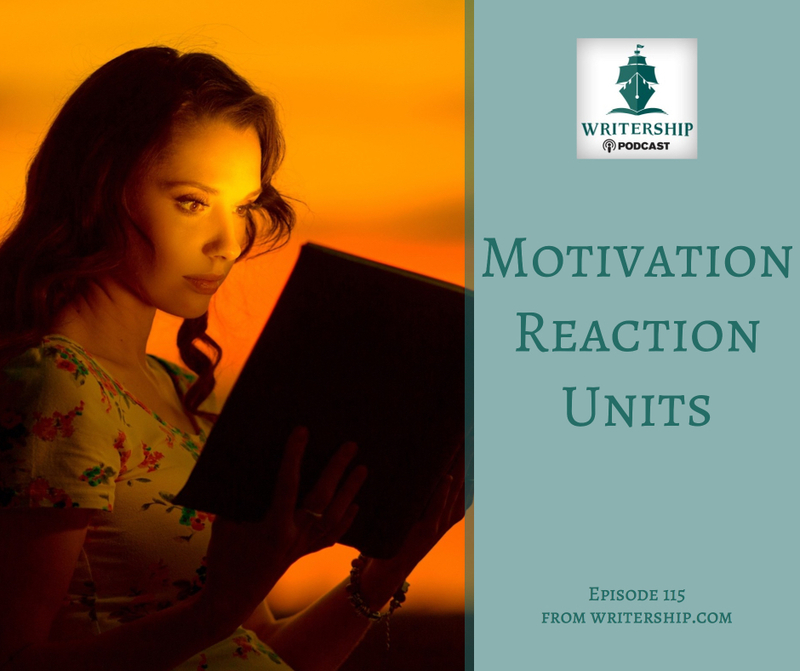 Our big takeaway is that regardless of the POV that you choose for your story, you can make the scenes stronger by paying attention to the Motivation-Reaction Units. Dwight Swain mentioned these call-and-response sequences in his 1965 book, Techniques of the Selling Writer. They take into account the fact that people react in certain ways: voluntary and involuntary, internally and externally. If you make a practice of tracking these motivating events and character reactions (presented in the order they naturally arise people), you’ll write stronger scenes that allow your reader to experience the story events rather than read about them. We noticed that Abby reacts within the scene, but not in the full range that she could. Because people react to stimulus in the following ways, you can use these categories to plot Abby’s reaction to what’s happening to her. Consider making a list of motivations and Abby’s reactions and filling in the gaps. You don’t need to show something in each category for every motivation, but consider which ones will help you tell the story unfolding in this scene. What can you show us about Abby in this moment that will change over the course of the story. You have a great opportunity when Abby’s mother tells her that her grandmother has died, but there is no immediate reaction on the page. People have a wide range of reactions when they hear that someone close to them has died, and that might include going silent (no external reaction), but you can bet something is happening on inside or they are at the very least feeling numb. With a third-person limited POV, you can get very close to Abby’s experience of hearing that a loved one has died—and remember this coming right after a devastating breakup. This is a great vehicle for revealing character because the reader gets the inside scoop on what she shows the world and what she really feels and thinks. For some characters this gap will be tiny, and for others, it could be massive. Now, if you had written this scene from Abby’s mother’s perspective, Abby’s silence would be something for her to react to. Her mom does react when she says, “Hello?” But again, you might want to show her involuntary feelings and reflexes before revealing her more considered response. Here are some picky items to watch for when you’re in the copyediting phase. The convention for spacing between sentences has changed. Now it’s only a single space. Punctuation goes inside the quotation marks for dialogue (with minor exceptions) when writing for a US audience; UK generally goes outside. Consider what your ideal reader is used when you decide. In this story, I’m assuming US because it’s set here. I made these changes and accepted many of them to keep the copy readable in the show notes. You can download the dialogue punctuation sheet as a guide while revising. Consider using said and asked as dialogue tag staples. They tend to disappear so that the character’s speech takes center stage. Suspension points take a space on either side of the marks (like … this). If you want to show a thought or speech trailing off, then the suspension points are appropriate. If thoughts or speech are interrupted, represent this with an em dash (—). Typically, if you’re going to interrupt the character’s speech with a dialogue tag, it comes after the first sentence or near the beginning. Once the character has gotten this far into what they are saying, the tag isn’t necessary. No quotation marks necessary for a term like black sheep since it’s being used in its usual sense. Unless you mean it in an unconventional sense, are quoting someone else loosely (e.g., “her silly art school plans”), or indicating sarcasm, quotation marks aren’t necessary and can act like speed bumps for the reader. Thanks again for your submission and for trusting us with your words!